An essential guide for companies new to Factoring & Invoice Discounting. 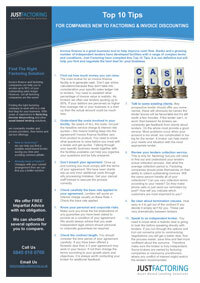 Invoice finance is a great business tool to help improve cash flow. Banks and a growing number of independent lenders have developed facilities with a range of complex terms and conditions. Just Factoring have compiled this Top 10 Tips. It is not definitive but does list the key issues to negotiate a better invoice finance facility the best deal for your business.